I've been away for a while and there were quite a few application releases that I had to update in the WebUpd8 PPAs, so here's what I've updated and what's new (I won't post minor updates though). Audacious is an audio player that focuses on high audio quality and low resource usage. It ships with numerous plugins and 3 interfaces: a GTK (the PPA packages are built with GTK2) interface, a Qt interface, and a Winamp 2.x like interface (it supports Winamp 2.x skins). The application was updated to version 3.8, bringing support for running multiple instances, each with its own configuration, a new Ampache browser plugin (Qt interface only; also, this is only available for Xenial and Yakkety in the PPA due to its dependencies), more seamless cuesheet support, and more. 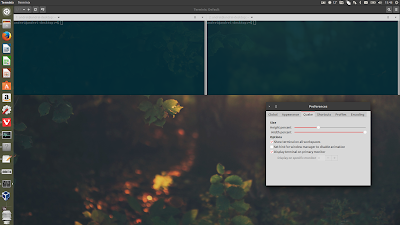 Terminix is a GTK3 tiling terminal emulator that allows splitting terminals horizontally and vertically, and rearrange them using drag and drop. Terminix was updated to version 1.3.0, getting a much requested Quake mode, along with various other changes. There was a bug in Terminix 1.3.0 that caused building it on 32bit to fail (at least in Ubuntu 16.04), but thankfully, Gerald Nunn, the main Terminix developer, quickly fixed it and I added the fix as a patch to the PPA package. Unfortunately I can only build Terminix in Launchpad for Ubuntu 16.04 for now. For Ubuntu 16.10, there are still issues with its dependencies not building (that's why there's no Terminix in the Ubuntu 16.10 repositories, even though Terminix is available in Debian, even though it wasn't updated to the latest 1.3.0 version). However, I've copied the Ubuntu 16.04 packages to 16.10 in the PPA, so you can use the PPA in Ubuntu 16.10 (but do so at your own risk). various bug fixes and small tweaks. The new Quake mode supports some configuration, like changing the window width and height, option to show terminal on all workspaces, or a specific monitor. There's no option to hide the terminal on lose focus though. 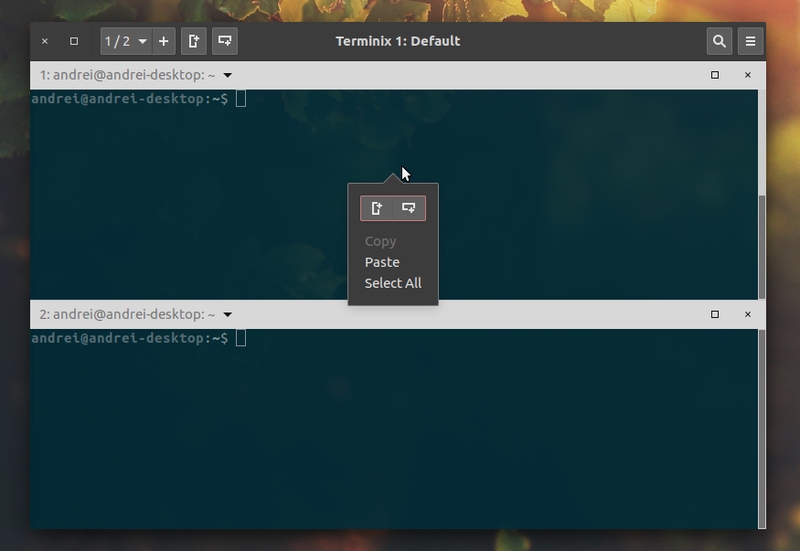 To use the Quake mode, you must launch Terminix with the "--quake" option ("terminix --quake"). The keyboard shortcut for invoking Terminix in Quake mode is not built into Terminix, and you must set it from your desktop environment's system settings (e.g. in GNOME / Unity, you can do this via System Settings > Keyboard > Shortcuts, under Custom Shortcuts, where you must add the "terminix --quake" command, and assign it a custom shortcut). The password integration feature allows inserting a password from GNOME Keyring. This feature causes a segfault (bug report) when used for some, including on 2 virtual machines I've tried it. However, it works in Ubuntu 16.10 for me, I'm not sure exactly what's going on (probably a missing dependency, but I can't figure out which). To configure it, in the Terminix Preferences, on the Shortcuts tab, you must assign a keyboard shortcut for "Insert password" (it's under "Terminal"). * The Ubuntu 16.10 Terminix package is copied from Ubuntu 16.04 (it doesn't build in Ubuntu 16.10 in Launchpad). I didn't encounter any issues using it so far, however, if you do encounter issues, there's nothing I can do. 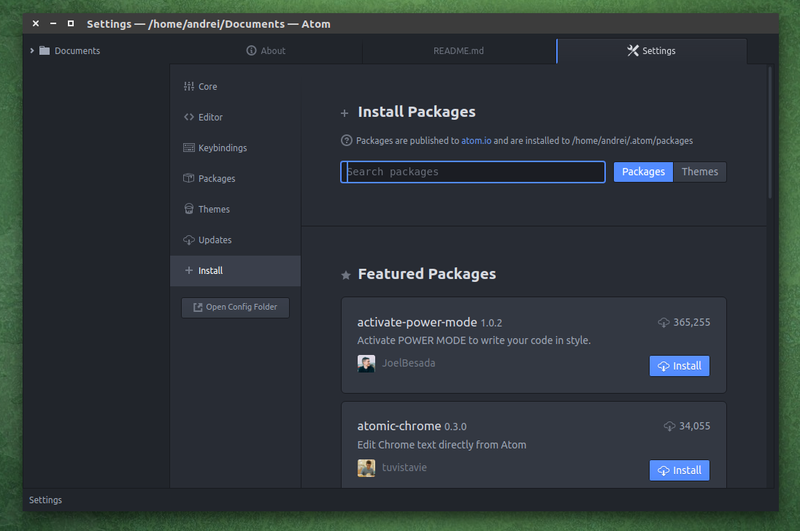 Atom is a free, open source "hackable text editor for the 21st Century" developed by GitHub, available for Linux, Windows, and OS X. 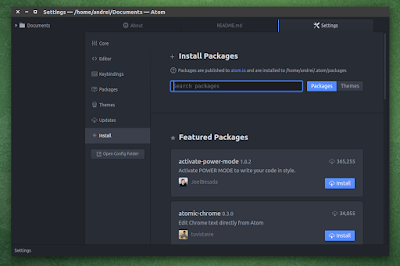 It features a built-in package manage that allows searching and installing new packages (and themes) from within Atom, smart autocompletion, file system browser, multiple panes, and more. Atom 1.11.1 (and 1.11.0) was released recently and I wanted to updated it yesterday because I know many of you rely on the WebUpd8 PPA to get your Atom updates, especially since there are no official 32bit binaries for Linux, but I encountered a bug that causes Atom to be built for 64bit, even though the build system is 32bit. I reported the bug but it looks like it won't be fixed anytime soon, unless someone contributes a PR. Even though this wasn't fixed, I decided to update the PPA anyway, with Atom 1.11.1 for 64bit, while continuing to provide Atom 1.10.2 (the last of the 10.x series) for 32bit. I tried various workarounds for this issue but unfortunately I didn't manage to find a way around it. various other changes and bug fixes. A complete changelog can be found HERE. 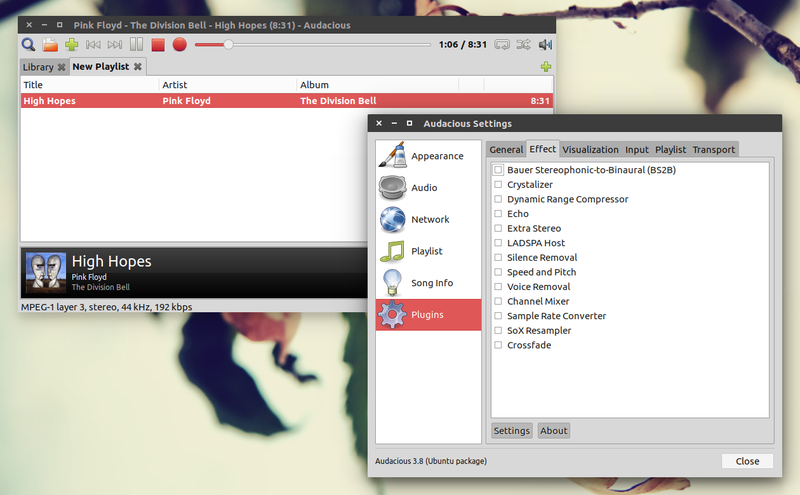 Dock Applet is a MATE panel applet that displays running applications/windows as icons. the applet can now use the Compiz Scale plugin to list multiple open windows of the same application (here's a screenshot). 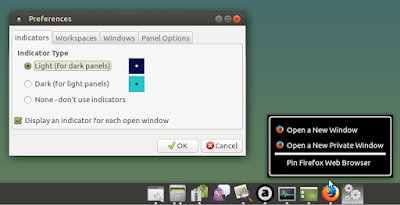 For this to work, you'll need to be using Compiz (obviously), enable the new "From window thumbnail previews (requires Compiz)" option, which can be found in the MATE Dock Applet preferences, in the "Windows" tab, and to enable the Compiz Scale and Dbus plugins via CompizConfig Settings Manager. 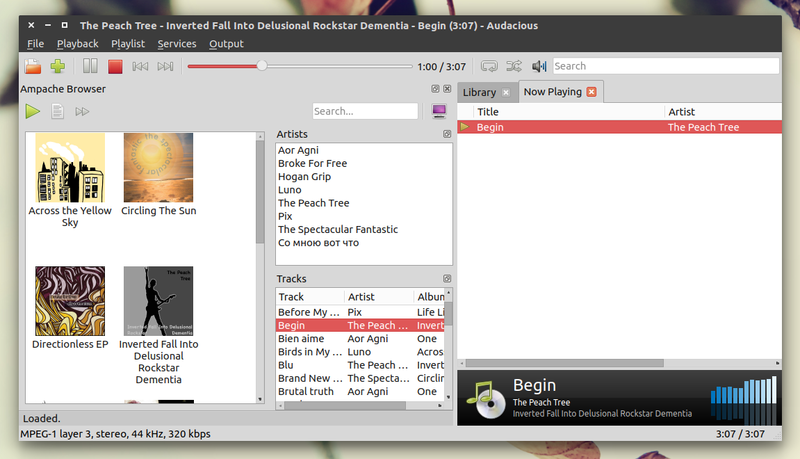 Note that this feature does not work with minimized windows. 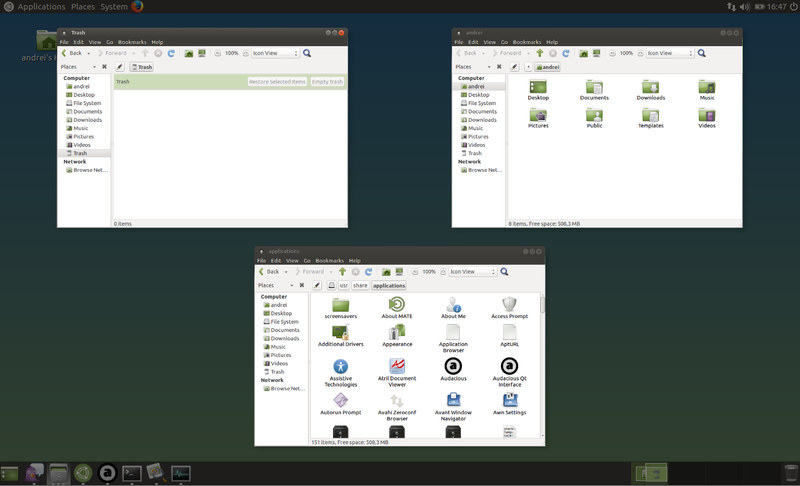 For Ubuntu MATE 16.10, you should already have the latest MATE Dock Applet (version 0.75 is available in the official repositories). The second WebUpd8 PPA update part is HERE.